Duelling with wax bullets, New York, 1909. 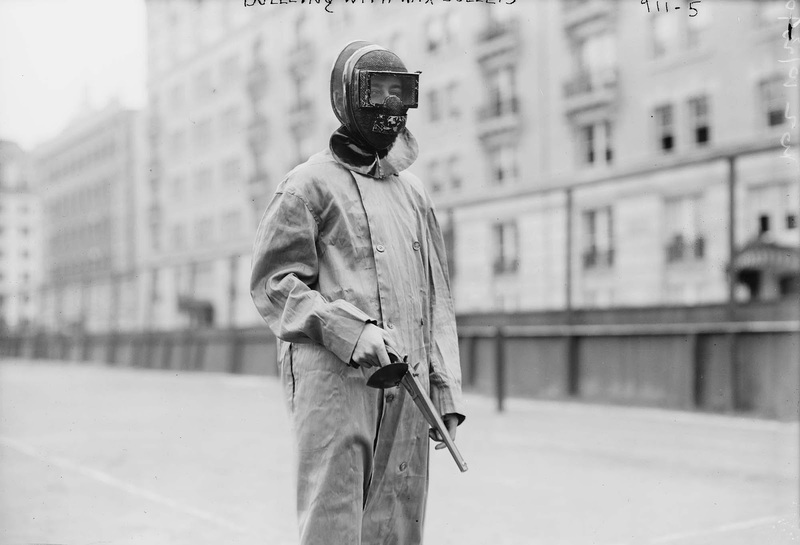 In the early 1900s, the age-old custom of pistol dueling was briefly resurrected as a non-lethal sport by using wax bullets. While it still involved men shooting firearms at one another, the difference here was that defeated parties could be “theoretically pronounced dead… and the supposedly fatal results created general merriment”. 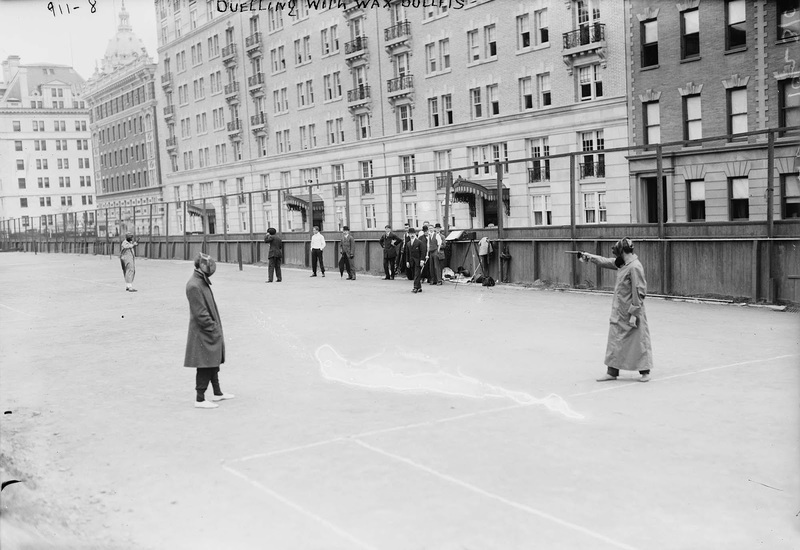 These pictures show the first public exhibition of wax bullet dueling in America. The duels in question took place at Carnegie Hall in New York, with participants drawn from the Carnegie Sword and Pistol Club. The men faced off 60 feet apart, outfitted in black robes and face masks. Their regulation .44 calibre French dueling pistols were loaded with French-imported wax bullets and the novel display enjoyed a small audience. Wax bullet duels appear to have first emerged in France, and in the early 1900s, a “School of Dueling” was established in Paris. At the elite academy, practice duels employed wax bullets, and trainee duelers wore protective face masks, but in every other way, they followed the rules and honor codes of classic dueling. A version of the sport was even featured as a demonstration event at the 1908 London Summer Olympics, in addition to its inclusion at international pistol and revolver championships. The wax bullets did not use propellant as the lightweight hard paraffin wax projectile could be propelled at speeds of up to 450 feet per second (140 m/s) with only the primer. This saved the cost of the propellant and of the lead and the rounds could be manufactured much more rapidly and safely. 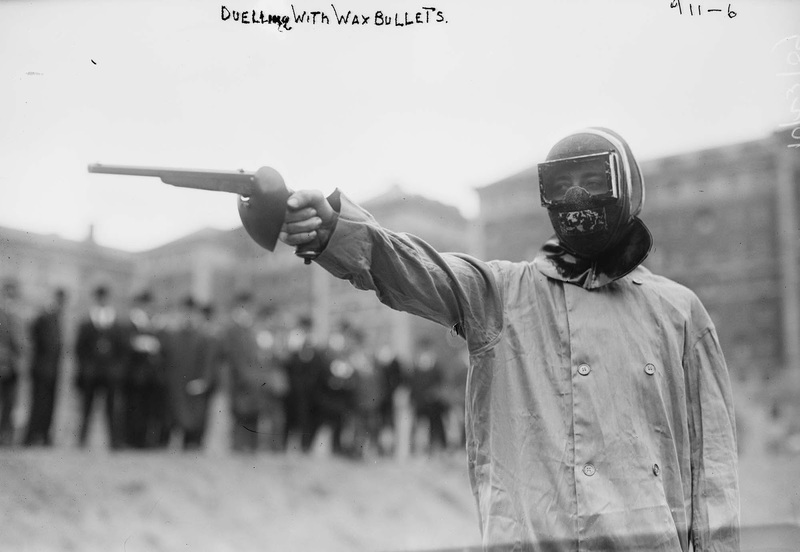 While still lethal if fired at a human target at close range, the wax bullets were much less prone to kill or injure participants of the event. However, without adequate protection the bullets could still lop off bits of the body, and spectators needed to be wary of any stray bullets, especially in the vicinity of their eyes. Note the handguard on the pistol’s grip to shroud the shooter’s exposed hand. The wax bullets used in 1909 were just less-than lethal. This duel ended in a draw so to speak with both men ‘killed’ in theory yet very much alive. 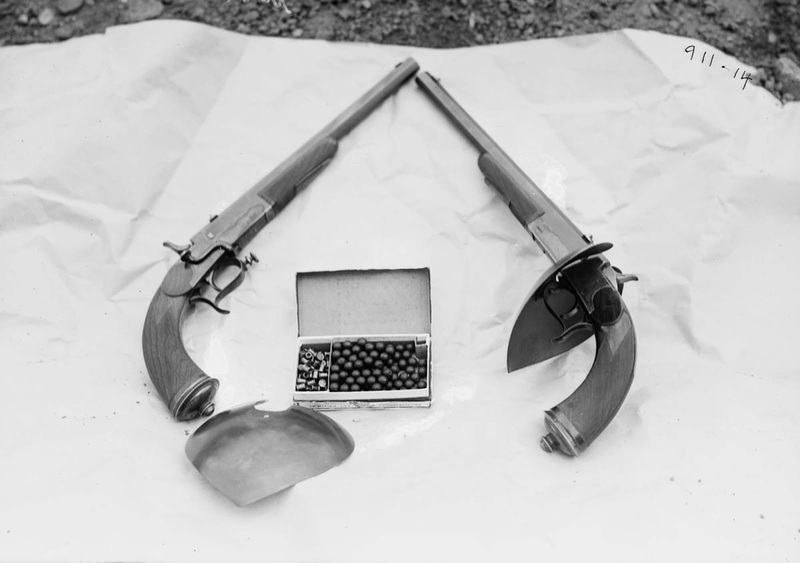 The modified .44caliber blackpowder pistols used in the 1909 exhibition. Note the handguard removed on left (showing mounting bracket), and fitted in place on right for comparison. The cartridge box in the center shows the outsized precussion caps, about the size of a .22 short on the left, and wax .44 diameter balls on the right.